The Iowa Department of Natural Resources (DNR) will release 14 trumpeter swans at three locations in southwest Iowa as part of the effort to create a self-sustaining population of swans south of Interstate 80. All releases will occur rain or shine. Six swans will be released on the north side of Lake Icaria at the east boat ramp on May 9 at 9:30 a.m., in partnership with the Adams County Conservation Board. Two swans will be released at Viking Lake near the restaurant/beach area on May 9 at 1 p.m.
Six swans will be released at Lake Anita on May 10 at 1:30 p.m., in partnership with the Cass County Conservation Board. These releases are part of the Iowa DNR’s statewide effort to restore trumpeter swans to Iowa that began in 1993. Trumpeter swans were once common in Iowa, but were gone from the state by the late 1880s. By the early 1930s, only 69 trumpeter swans remained in the lower 48 states. It takes six years, on average, before trumpeter swans successfully nest. Last year, Iowa was home to 54 pairs of nesting trumpeter swans; however, only two of those nesting pairs were south of I-80. Dave Hoffman, wildlife research technician with the Iowa DNR, said the goal is to raise that number to eight, which would likely create a self-sustaining population. 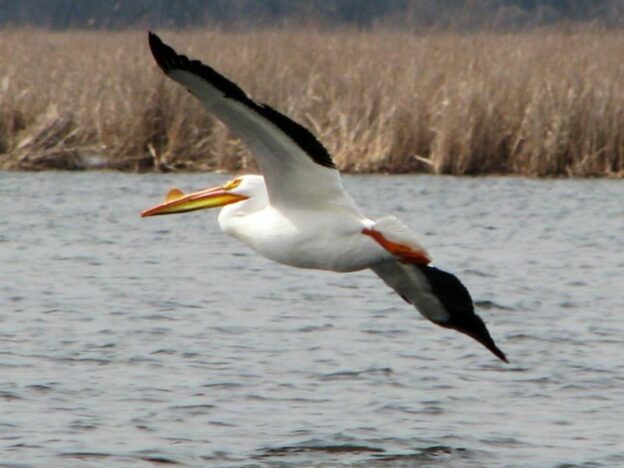 As the largest North American waterfowl, these all-white birds can weigh up to 32 pounds and have an 8-foot wingspan. The trumpeter swans being released are young and flightless and will imprint on the area where they learn to fly, returning each year as open water is available. The swans were donated to the project from zoos in Cleveland, Kansas City, Green Bay, Wis., Oklahoma City, Bronx, Anchorage, Alaska and Maryland. Each event includes a swan and wetland presentation, an opportunity to touch and view the swans up close, and a photo opportunity with the kids. Staff from the Kansas City Zoo will be on hand offering educational activities, and filmmaker Steve Harryman may be at these releases collecting footage for an upcoming documentary “Return of the Trumpeter Swans, in partnership with the Trumpeter Swan Society. For more information, contact David Hoffman at David.Hoffman@dnr.iowa.gov or 641-425-0737. This entry was posted in Conservation, Educational, News on April 17, 2019 by Pamela. Explore some of the most beautiful trout streams in the Upper Midwest, here in Iowa. A true angler’s paradise, hundreds of miles of cold water trout streams meander through Northeast Iowa. Some streams are easily accessible in parks, and others are in wild and remote natural places. Catch wild and stocked Rainbow, Brown and Brook trout. Schedule time during your next trip to northeast Iowa to visit one of Iowa’s three trout hatcheries – Manchester, Decorah, or Big Springs. The grounds to each facility are open to the public year round from sunrise to sunset. Find your favorite trout stream and when it will be stocked with the Trout Stream Stocking Calendar at https://www.iowadnr.gov/Fishing/Trout-Fishing or call 563-927-5736 for current trout stream or urban stocking information. The past 20 years, northeast Iowa has seen a dramatic increase in the miles of stream that support populations of trout fully sustained through natural reproduction. Over 75 streams now have some level of natural reproduction and provide an excellent opportunity for anglers to pursue wild trout. These increases occurred as watersheds were improved, in-stream habitat was installed, improved trout genetics were used, and Iowa had an extended period of above average annual rainfall. Iowa’s put-and-grow streams are stocked with fingerling brown trout. These streams are entirely on private property – you need permission from the landowner to fish them. Fingerling trout are also stocked into streams open to public fishing. Brook Trout from South Pine Creek are the only know population of native Iowa Brook Trout. In 1995, Iowa DNR staff started to spawn trout from South Pine Creek to restore populations in other NE Iowa cold water streams. Adult Brown Trout from French Creek are spawned and their offspring stocked as fingerlings into cold water streams with suitable water temperatures and habitat conditions. Several populations of naturally reproducing Brown Trout have been established in northeast Iowa streams using this stocking approach. Fisheries staff play an active role in trout stream projects to improve and maintain quality water and habitat that benefit both trout and trout anglers. They have worked with 18 landowners to protect over 10 miles of streams in Northeast Iowa with Angler Conservation Easements. Successful water quality improvement projects are led by groups and communities that partner with the DNR to create and implement long-term plans to improve the land and water. Using conservation practices on the land upstream is key to help stop sediment, nutrients and bacteria from entering into the stream. Several projects are currently ongoing in Northeast Iowa. The longest running project was implemented in 2000 on the Upper Iowa River. It continues to secure funding for additional tributaries within its watershed and on the immediate corridor. Watershed improvement projects have helped many trout streams by changing the way water flows through them. Bank stabilization projects occur on public and private owned properties. Cut banks are stabilized by bank shaping, armoring with rock, seeding, willow stake planting and cedar tree or root-wad revetments. Landowners who want to improve the habitat in their trout streams should contact the Decorah or Manchester fish management biologist for help with project plans and potential funding sources. Iowa residents and nonresidents who are required to have a fishing license must pay the Trout Fee to fish for or possess trout. Exception: Children under 16 may possess or fish for trout without having paid the Trout Fee if they fish with a properly licensed adult who has paid the Trout Fee and together they limit their catch to the one person daily limit of five (5) trout. Children under 16 can buy their own trout privilege, which allows them to fish without a properly licensed adult and keep their own daily limit (5). Length Limits: None, except a 14-inch minimum length limit applies to all trout in Spring Branch Creek (Delaware Co.), from the spring source to County Hwy. D5X as posted, and on brown trout only in portions of Bloody Run Creek (Clayton Co.) where posted. Daily Bag & Possession: All waters – Combined daily of 5 and possession of 10. This entry was posted in Educational, Fishing on April 13, 2019 by Pamela. This entry was posted in Educational, Safety on April 2, 2019 by Pamela. 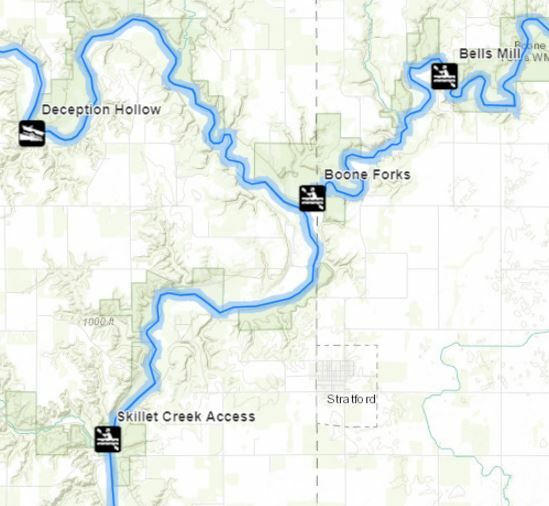 The Iowa DNR has an active and ready for use interactive paddling map that helps with trip planning, getting directions, and just exploring rivers from your desktop. 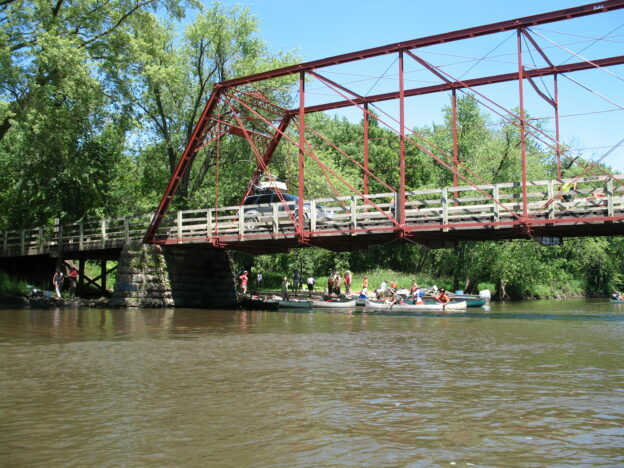 Go to https://www.iowadnr.gov/Things-to-Do/Canoeing-Kayaking/Where-to-Paddle to view it. You can also download a PDF that offers detailed instructions on how to use the map at this same page. Last year a number of bridge construction projects located on popular stretches of river created barriers to navigation. Projects, to name a few, were reported at North Trailhead Access on the West Fork of the Des Moines River, just downstream of Bever’s Bridge Access on the Boone River, and at I-35 on the South Skunk River. These projects employ coffer dams that behave no differently from a typical low-head dam so it became critical to get the word out. A one-time press release just wasn’t enough, as some of these projects are under construction throughout the paddling season. The River Programs utilized ESRI’s ArcGIS Online tools and functionality to deploy an online interactive map to display river data so it could be used in relation to these temporary hazards. While some data have discrepancies, the team continues to improve data quality and add more functionality to the map. It’s a work in progress, but offers a lot of information to assist paddlers in trip planning or exploring Iowa’s rivers. All features of the map are clickable, providing more information. You can click on river or portage lines to get distances, or click on access symbols to find out maximum slope or the number of parking spaces. You can also change the map under the data (basemap) from a topo map to aerial photo coverage-there are more than six different maps to choose from. Lastly, you can get street directions between two or more points, which makes it easy to determine your shuttle route. There is more to come. As we improve the quality of the data with the help of field workers and volunteers, we will also add more functionality, like the ability to print maps and add stream gauge information. If you’d like to assist the DNR in making our data more accurate and useful, please contact:John Wenck, DNR Water Trails Coordinator at john.wenck@dnr.iowa.gov or 515-725-8465. This entry was posted in Educational, News on March 22, 2019 by Pamela. Can be downloaded and paper copies can be picked up at assorted Conservation offices and Nature Centers. Go to https://www.iowadnr.gov/ for online viewing. This entry was posted in Educational, Water Trails in Iowa on March 18, 2019 by Pamela.